In The Healing Consciousness, I share my journey from a traditional Western medicine practice, to a place where healing and curing disease become one. Medicine has always been my calling. Actually medicine was my guide to healing; my soul’s purpose. The first thirty years of my life I was so focused on becoming a physician, I overlooked the many gifts that were already present in my life. Through powerful experiences with patients, friends and family, I have gained insight into what healing truly is and how we find it. Every human being has moments when we are touched by the divine, but many fail to recognize them as such. By awakening to an awareness of these synchronistic events, we begin to embrace the connection that exists between all beings. Adversity can be the greatest teacher the universe can throw at us. If we are unable or unwilling to be open to change, we will miss the opportunity to grow and to experience the wonders of truly “living.” I have never been afraid of change, but now I welcome it as yet another opportunity to grow as a spiritual being. Breast cancer, like any disease, brings about change that is seldom anticipated and never desired. 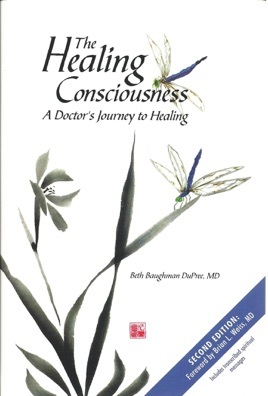 My goal as a doctor and healer is to ease my patient’s passage through this process of change. Creating a new and better existence may not seem to go along with a diagnosis of cancer, yet the level of adversity cancer brings allows for tremendous growth in positive ways. Helping to eliminate the fear that surrounds the disease is often the most daunting task. Not only do patients manifest this fear, but often so do the spouses, parents and children involved. Fear has the ability to paralyze even the strongest human beings. Alleviating this fear, the fear the cancer may return and ultimately the fear of death, is often more challenging than treating the physical cancer. I have experienced the greatness that the release of this fear can manifest. I see the healing process unfold before my eyes on a daily basis. I have been able to create balance within my own life since I began to follow my own advice—advice I have given to my patients for years. I have been on a journey for years not knowing exactly where I have been heading. I have chosen to share my experiences as a physician and healer with you just as I have chosen to welcome the healing consciousness in my life. The healing consciousness is the awareness found deep within oneself, where you embrace the eternal nature of your soul and release all fear of death. Embracing this awareness, you are completely free to experience the journey of life. Illness and disease can be our teachers. They empower us to embrace the moment and live the journey to the fullest; as no one is guaranteed tomorrow.